Note: SXSW 2014 has begun, and for the next couple of days I will be posting reviews of films that I will happen to catch. The following review is the same review of No No of when I reviewed it at Sundance. I just saw the film again here in Austin and I felt that I should support the film by re-posting the same review. If you didn’t read my review of the film from Sundance, then by George this is your lucky day. Enjoy. As I write and post this review, it looks as if Park City has come to Austin, in the vein of chilly weather I mean. But I probably should word this by saying that Austin has come to Park City, as a few months back when I was at Sundance, I caught the world premiere of a documentary called No No: A Dockumentary, which tells the story of legendary baseball pitcher Dock Ellis, who is both famous and infamous for his contributions on and off the field. Several websites, including the Hollywood Reporter, have been raving about the film since it’s premiere at Sundance. The film just showed at SXSW, and I happened to have seen it again for a second time. Let’s get on with the review then. The film chronicles the life of baseball pitcher Dock Ellis, from growing up poor in inner city Los Angeles, to having a successful career in the minors to then becoming a starting pitcher for the Pittsburgh Pirates in the late 60′s, early 70′s, the same team that included legendary outfielder Roberto Clemente. Dock, who described himself as the “Muhammad Ali of baseball”, was a conflicted human being. His first marriage ended as his drug addiction and drinking caused Ellis to nearly kill her, and was married three more times in his life. But the one thing that people remember Dock Ellis for is the no-hitter he pitched on June 12, 1970. Ellis through a no-hitter against the San Diego Padres in San Diego, but he happened to be high on LSD at the time. The film was directed by Jeff Radice, who has produced a number of documentary shorts before directing No No. I really admired how Mr. Radice made this picture, as he did feature the usual talking heads of baseball aficionados and sports writers, but he includes lengthy interviews with people from Dock’s life. He interviews family friends, ex-wife’s, and Doc’s sister and niece, who were both at the screening that night. You also see interviews from teammates of Dock, including Dock’s former agent and friend Tom Reich, who described in the documentary that Dock was his first client, and Mr. Reich went on to become one of the top sports agents of the 20th century. 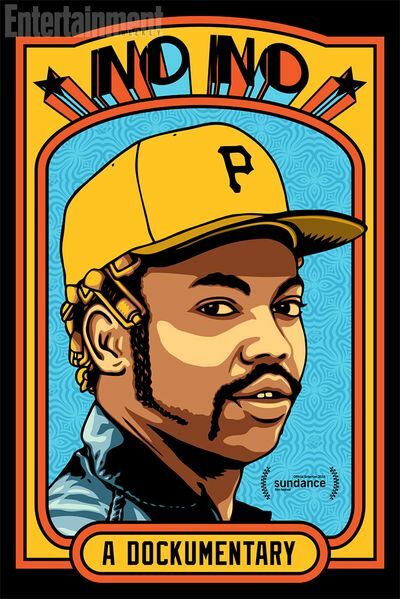 The stories that everybody tells of Dock Ellis in the film is one of the many reasons why you must see this film to believe the story of one of the most unique sports figures that ever lived. I also was fascinated by how Mr. Radice told this story, as he uses lots of archival footage from games that Ellis pitched, as well as 8mm and 16mm home movies of Dock, as well as public and private photos that showed Ellis as an extremely colorful athlete. If you look up the gorgeous one sheet poster of the film online, you can see Ellis with curlers on the sides of his head, as the film opens with the controversy Ellis caused the then very conservative MLB by pulling a stunt like that. The film isn’t made like a typical documentary, as it first begins with his childhood to death, but it jumps around a lot in time, and it makes the film quite exciting and entertaining, especially the segment describing Ellis’ no-hitter on LSD. Mr. Radice incorporates popular funk music from the 1970′s that booms through the speakers of the theatre, and maybe it was just our theater when we saw the film, but it was very loud, but that enhanced the experience for everyone, or for me at least. But the film then makes a sudden turn in the third act, as it shows Ellis’ rehabilitation into a better person, sober from drugs or alcohol, and how he was able to help other struggling addicts with problems similar to Dock’s. Dock did this from the 80′s up until his unexpected death at the age of 63 in December of 2008, right as the filmmakers were gearing up to make this film. There is a large sense of sadness about the whole situation when addressed in the film, as the man was one of a kind, and stood out from the rest of other colorful athletes before and after. So to sum it up, No No: A Dockumentary is a fascinating account of one of the most overlooked players in Major League history that also happens to be wildly entertaining and funny, as well as being tragic and uplifting. As a massive fan of documentary filmmaking, I loved the picture, and when the film gets a distribution deal out of SXSW or beyond, I highly recommend that you see the film in whatever capacity it is released in. March 8, 2014 in 2014 Film Reviews, 2014 SXSW Reviews, Film Fest Coverage, Movie Reviews.